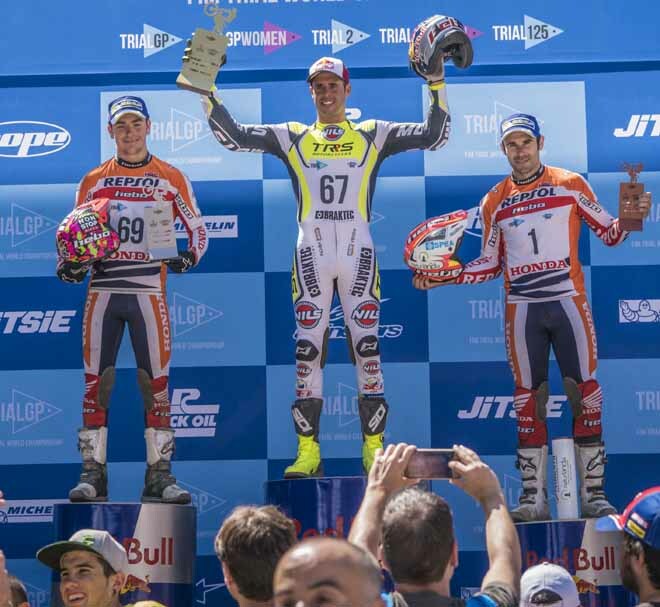 Adam Raga - TRS won the war of attrition high in the Pyrenees at the TrialGP Andorra, round three of the 2017 FIM Trial World Championship. 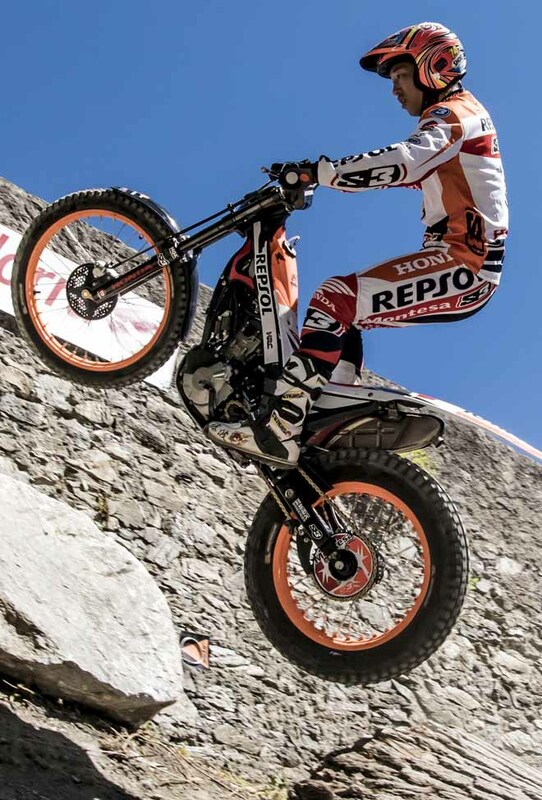 On a long, hot and physically demanding day the Spaniard kept his cool to inflict the first defeat of the year on reigning champion Toni Bou - Repsol Honda and reduce his compatriot's series advantage to just ten points. 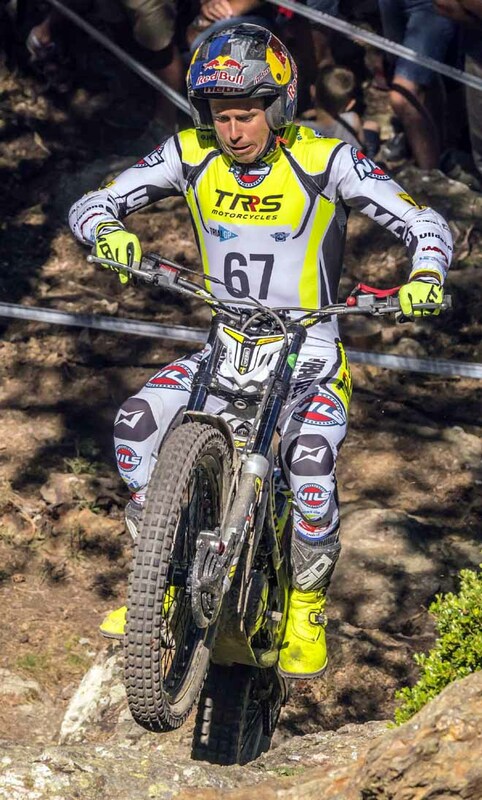 The result also ties Raga with the great Dougie Lampkin on seven wins apiece at TrialGP Andorra. "I'm always delighted to beat Toni and to stop his unbeaten run makes today's result even more special," says Raga. "I've been working very hard on my physical conditioning and on the motorcycle and this preparation has paid off today." "The team has also put a lot of effort into the bike and I'm confident we now have everything in place to challenge for further wins until the end of the season." Bou, who has been in imperious form this year, actually slipped to third as his team-mate Jaime Busto - Repsol Honda picked up a career first podium with a strong ride to second in what was a very close scoring Trial. After the opening section in the centre of Sant Julia de Loria where Bou now calls home, riders headed up into the mountains where the remaining sections were plotted on the side of a steep, wooded valley. The field then remained in the mountains and after a twenty-minute break they began their second lap at section two, only returning to the town centre at the end of the competition to sign off with a final attempt at section one. Bou's opening lap would prove to be his undoing and four maximums placed him four marks behind rising Spanish star Busto and six behind Raga on observation at the halfway stage. With all of the TrialGP riders choosing to err on the side of caution, the entire eighteen-man field picked up time penalties and when these were added on it was Busto who led Raga by one mark after lap one with Bou a further six marks adrift. As we have seen so often before, Bou - bidding for his eleventh consecutive FIM Trial World Championship - upped his game on the second lap. After parting with just one mark on lap two the victory hinged on section fifteen which had taken maximums off every rider at every attempt. Having seen Raga drop a five and with just Busto following him, Bou knew that simply to get through with a three would put victory within his sights but it wasn't to be and his fifth maximum of the Trial handed Raga the win on thirty-two from Busto on thirty-three and Bou on thirty-four. 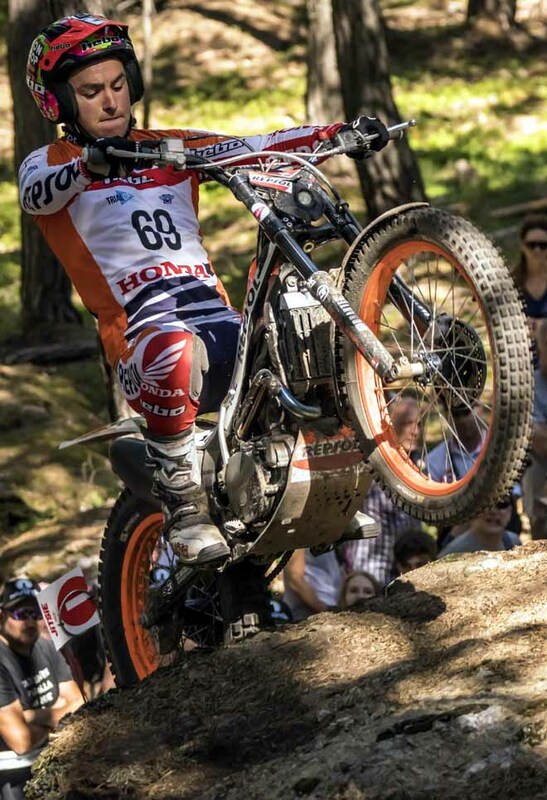 Spain's Jorge Casales - Beta took fourth from Japan's Takahisa Fujinami - Repsol Honda. 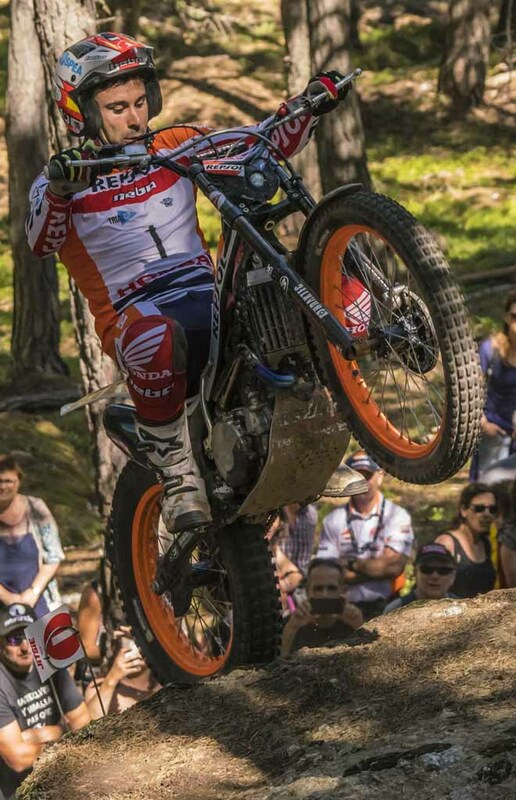 Spanish riders filled the next three places with Jeroni Fajardo - Vertigo sixth ahead of Albert Cabestany - Sherco and Arnau Farre - Gas Gas. The Trial2 competition was dominated by France's Gael Chatagno - Gas Gas whose total of nine was ten marks ahead of second-placed Luca Petrella - TRRS from Italy who beat Spain's Marc Lazaro - TRRS on most cleans. Britain's Iwan Roberts -Beta was fifth, but retains his series lead. 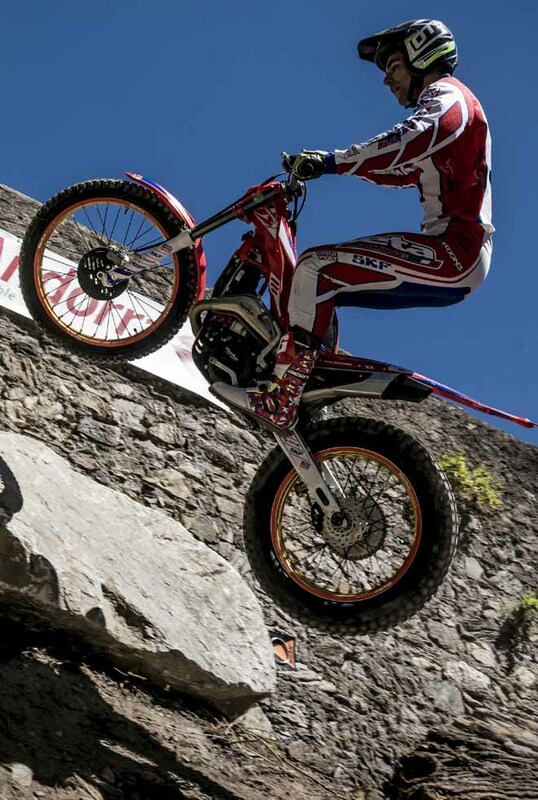 In Trial125 Italian Lorenzo Gandola - Scorpa won from Billy Green - Beta to extend his series lead over the British rider. France's Hugo Dufrese - Gas Gas was third. The 2017 TrialGP series continues in France next weekend.